Fossil has been busy stirring up the smartwatch world, launching a number of devices over the last year in collaboration with several fashion companies. The latest to join the party come from Diesel, Kate Spade and Emporio Armani. Like the other two fashion brands, the Emporio Armani collection opts for the hybrid path seen on the previously launched Skagen Connected. Here are our first impressions. The Emporio Armani Connected smartwatches follow the design route of some of the company's best-selling timepieces, adding Fossil's wearable technology to make them a little smarter than the classic models. Simple but sophisticated, the Emporio Armani Connected smartwatch is available in five models, comprising a stainless steel case with a stainless steel bracelet, a black case with a black bracelet, a rose-gold case with a brown leather strap, a stainless steel case with a blue leather strap and a gun metal case with a black leather strap. All the models within the collection offer a premium build with a simple watch face. The two bracelet models have a black face, the rose gold model has a white face, the blue leather strap model has a silver face and the gun metal case has a navy face. Despite the colour differences, the face design is the same however, with unnumbered lines representing the hours, the Armani logo sitting in place of 12 o'clock, a sub-dial in the bottom left of the display and the Emporio Armani Connected logo positioned above the hands. Like both the Diesel and Kate Spade hybrid smartwatch options, the Emporio Armani Connected smartwatches have a stainless steel underside with a slit for changing the coin-cell battery and there are three functional buttons on the right-hand side of the casing. These buttons are more subtle than on the Diesel models, offering a more streamlined finish, which once again coincides with the brand they represent. Armani is going for a smarter, more sophisticated look compared to the chunky but cool Diesel option. As the Emporio Armani Connected smartwatches are hybrid smartwatches, rather than Android Wear like the Michael Kors models, features are more limited. What you lose some functionality, you gain in subtlety and the result is that none of Fossil's latest fashion smartwatches look like smartwatches, which some will love. Compatible with both Android and iOS, the Emporio Armani Connected connects to a dedicated app where you'll be able to set certain preferences and filter smartphone notifications. You can set alarms, control music or take a photo on your smartphone directly from your wrist, as well as get vibration alerts or dial changes for specific smartphone notifications. The Emporio Armani Connected smartwatches will also keep track of your activity, calories and sleep, allow you to set goals and automatically change time zone when you travel. The coin-cell battery also means you won't need to charge your watch every night, as you do with Android Wear smartwatches and the Apple Watch. You won't be able to take calls or read a text message, but you will be able to see a second time zone immediately with a press of the middle function button, or see your activity progress with a push of the top button. Activity is shown via the top of the sub-dial, while the date is shown at the bottom of the sub-dial. The Emporio Armani Connected is a smart, sophisticated and well-built hybrid smartwatch. Like the Kate Spade and Skagen options also offered by Fossil, it offers an option for those who like the idea of getting more out of their watch but who aren't quite sold on a fully-fledged smartwatch. 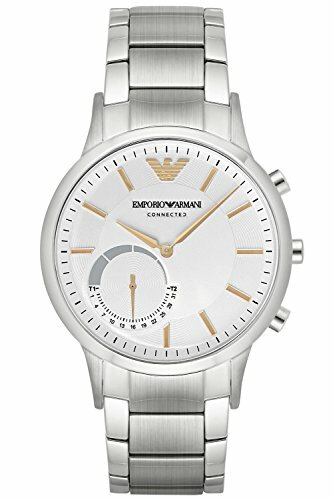 Being hybrid, it misses out on some of the features offered by Android Wear devices or the Apple Watch, but the Emporio Armani Connected looks like your typical Armani watch and that's where it will gain the hearts of those who want to be stylish and smart. Availability is yet to be confirmed, but the Emporio Armani Connected will be available from £259.